MOS Burger is a fast-food chain that originated in Japan and is located in East Asia and Australia. It is found everywhere in Taiwan. In fact, so far I have seen more MOS Burger locations than McDonald’s in Taipei! My sister and I shared a Yakiniku Rice Burger set for NT$135, which included a piece of fried chicken (not pictured). 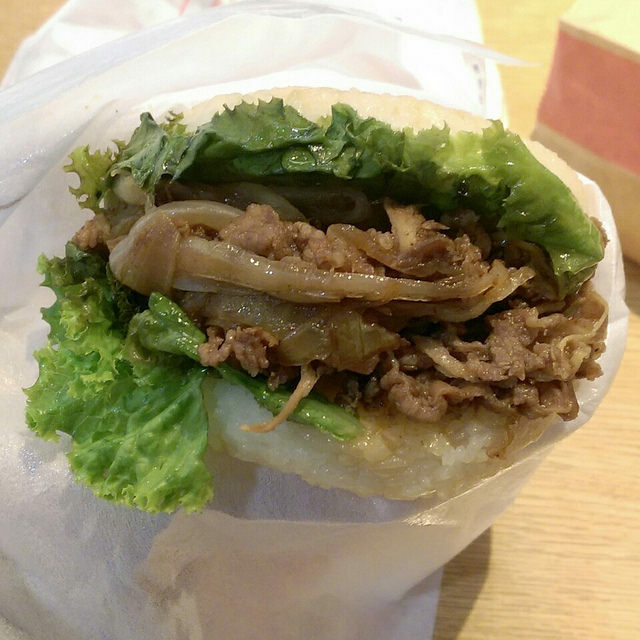 The burger had grilled steak, onions, and a slice of lettuce sandwiched between two rice buns. The burger was also small, but filling for both of us, from the rice buns. The fried chicken was a bit on the spicy side, but delicious! Oh! I saw Mos burger in Taipei but didn’t think to visit… but damn it, that looks so good haha. I regret my decision now.